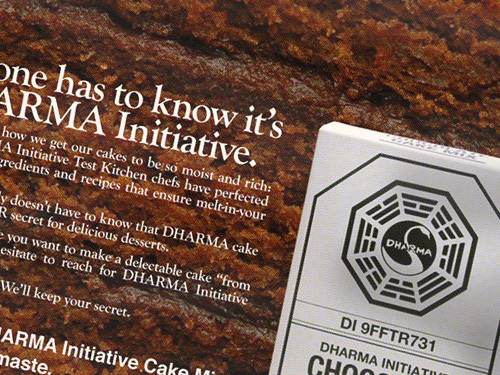 Just a few weeks ago we talked about baking up a delicious DHARMA Initiative cake (using DI Cake Mix, natch’). This week we found a 1972 ad for DHARMA Initiative Cake Mix in a fairly well-preserved copy of Social Welfare and Neuroscience. I’ve added this ad and the two others we previously found to the “Lost labels for your DHARMA Initiative needs” post. I’d rename it “Lost labels and vintage ads for your DHARMA Initiative needs,” but that would make a heck of a long WordPress URL. Hmm… I wonder if showing Miss T the ad will inspire her to bake up a DI chocolate cake? This entry was posted on Thursday, April 16th, 2009 at 6:38 pm	and is filed under Film/Video, Food, Graphic Design. You can follow any responses to this entry through the RSS 2.0 feed. Responses are currently closed, but you can trackback from your own site.